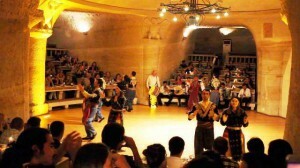 Belly Dance Show in Cappadocia Cave Restaurant !!! Belly Dance Show in Cave Restaurant !!! Cave restaurant welcomes you to most famous traditional Turkish show at the heart of Cappadocia. It is a perfect place with a capacity of 400 pax that enables the guest to relax and enjoy the night in a cosy, yet elegant enviroment in companied by delicious meals and impressive variety of home made wines. No meal option is 50 € per person, as included only drinks. Discover Cappadocia in a different way. 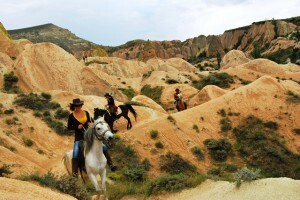 You can ride off on horseback through the valleys and the fabulous landscapes of Cappadocia. Horse back riding allows you to cover a great distance on small tracks well away from the traffic and crowds. You can get a feel for the area riding through a full day exploring the fascinating frescoed and rock-carved churches of the Goreme Open Air Museum Chimneys of Pasabag and Devrent Valleys. Visit the uniquely Turkish village of Avanos, and after lunch participate in a half day horse riding tour. We continue to the Cappadocian town of urgup and visit one of the well known wineries and sample some of the wine produced in the area. In the late afternoon enjoy a panoramic view over the Cappadocian landscape before returning to your hotel. 3 hours course 95 € around Zelve, Paaba and Cavusin. 7 hours course 110 € around Uchisar, Goreme, Gulludere, Cavusin. The horses are native Anatolian or Arab, crossbreds about 13 hands high. Some riding experience is necessary but everybody is responsible for looking after their own horse during the tour. Also we can offer special horse-back riding tours to your interests. Contact us to discuss how we can help you. 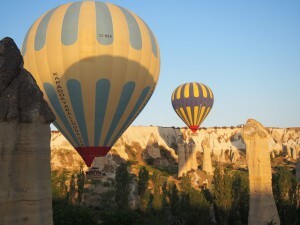 Cappadocia Balloon Tours on Sunrise !!! We pick you up from the hotel early in the morning, before sunrise. You fly over valleys of Cappadocia full of rock formations, fairy chimneys and natural beauty. Actual flight starts before sunrise and effective flight in the air is about 1 hour. As sample; You wake up at 5:00 a.m. and you are back at the hotel around 8:00 am. You have a Champaign celebration at the end of the flight. Flights might be cancelled depends on weather conditions by pilots on the day of flight if the weather is too windy. In case of cancellation, %100 of Balloon Flight payment will be refunded if its paid cash. If the payment has been made by credit card, %82 of Balloon Flight payment will be refunded.